Today’s “Fear/Greed Sentiment Index” reading has moved from “Extreme Greed” to “Greed” as of this week. Any return to new highs by the Major Indices will most likely move the needle back into the “Extreme Greed” territory. However, this second return to “Extreme Greed” territory will most likely signal the final rally of this move. Expect the first weeks of January to be tricky and counter-intuitive. Last week’s stock market strategy report said that the general market was surprisingly “oversold” and ready for an extension of the post-election rally. We certainly got that rally and more with the “Fear/Greed Sentiment Index” pushing into the “Extreme Greed” range for all 5 days. I would still expect a few days with readings over 90 before this rally has exhausted itself. But this is still no place to be going long and only the pros should consider heavy betting on the downside. If you’re inclined to trade, this may be a time to step aside and let the market zig-zag higher with non-confirmations or zig-zag lower into another short-term oversold condition. Either of these scenarios appears to be more than a week away. So stay on the sidelines and let the market set itself up for the next trading opportunity. STOCK MARKET STRATEGY FOR DECEMBER 4, 2016: The stock market has been correcting its move from the election lows over the past several days. 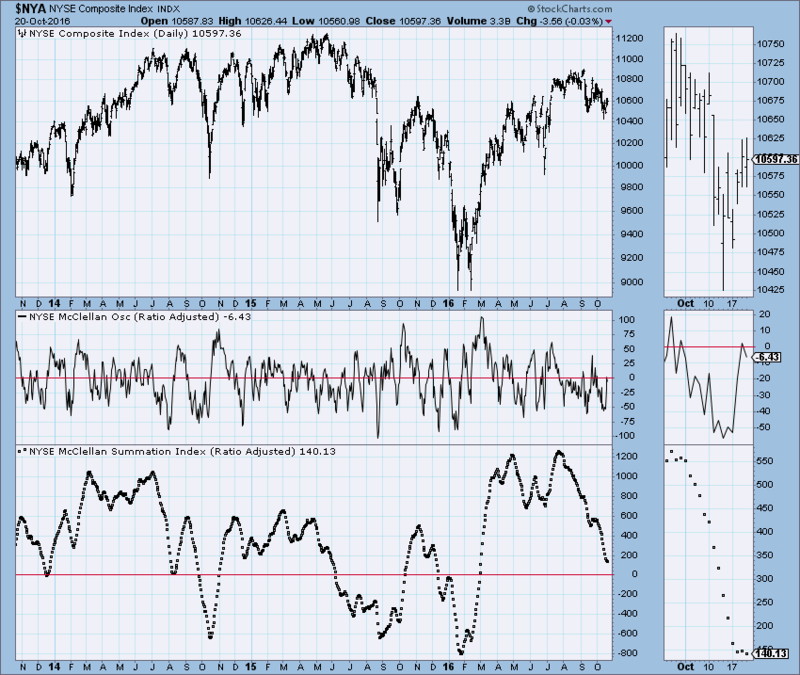 With the majority of internal breadth indicators at “oversold” readings, a short-term rally should begin now. This final rally should mark the end of the big move from February’s low. Look for this rally to be lead by the oil stocks and unconfirmed by the leading technology stocks which typically signals the end of a major move. THE BOTTOM LINE: The Fear/Greed Index is currently reading “Greed” after a short stint in the “Extreme Greed” territory. If we get a rally from right here, the new readings should mostly be in the “Extreme Greed” area and signal a time to get out of the market for the intermediate term. Expect a decline after this next rally to last two to three months and probably retract all of the “Trump Rally” and possibly more. But for now, look for one more short-term rally with several non-confirmations to finish this major move from the February lows. STOCK MARKET STRATEGY FOR OCTOBER 29, 2016: From a breadth perspective, the stock market is in an oversold condition right now. But it is days to a week or so away from reaching a similar level on a sentiment basis. With the big news on the political front Friday, that sentiment could change quickly to get in line with the breadth indicators causing a bottom to form around Election Day November 7-9. Be ready to buy long on a panic low forming around that time. 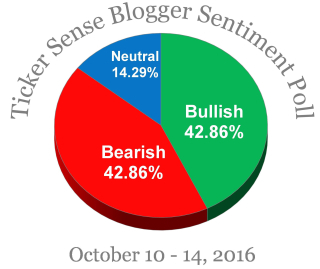 THE BOTTOM LINE: The sentiment indicators such as the Fear/Greed Index and the Blogger Sentiment Poll are in neutral positions. Before a sustained move in either direction, we need these indicators to go to an extreme. 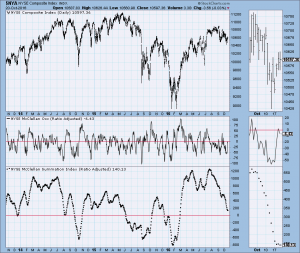 But the internal breadth indicators are now at oversold readings. This means that the breadth of the market has been extremely negative and is one of the key prerequisites to a bottom formation. That bottom looks like it is forming just in time for Election Day. Caution: It will be tricky and hard to catch at the exact bottom. Being a day or two early or late could cost you lots of money so be nimble and ready to buy incrementally into the panic. It will most likely be a V-shaped bottom. STOCK MARKET STRATEGY FOR OCTOBER 22, 2016: The stock market is in a neutral trading range as it sets itself up for a possible big move around Election Day. The internal breadth indicators are trending up suggesting that a minor short-term top could occur during the coming week. Then we could have a final drop into a low about November 7-9. Now would be a good time to get yourself ready to participate in a year-end rally of significance. But first, beware of news that will trick the public into selling right at the turning point…alas the Brexit vote. THE BOTTOM LINE: The internal breadth and sentiment indicators such as the Fear/Greed Index and the Blogger Sentiment Poll are in neutral positions. Before a sustained move in either direction, we need these indicators to go to an extreme. That takes time which means that nothing of significance will occur in the general market for a few weeks. Looking at the bottom chart of the Summation Index, I’d be very careful about trying to catch the bottom of this move. It looks like a giant head-and-shoulder top to me. That means a lot more time devoted to the downside and a reading of -400 minimum. After it crosses the -400 reading, you have about a 1-2 weeks lead-time before the final bottom is reached. And as we all know, the exact bottom is usually very tricky to catch….better to scale-in on the final leg down. STOCK MARKET STRATEGY FOR OCTOBER 16, 2016: The stock market is approaching oversold readings in all of the internal breadth indicators that I monitor. This suggests that a rally is possible next week after further initial weakness in the overall stock market. With the Fear/Greed Sentiment Index within range of an “Extreme Fear” reading, it certainly appears likely that, given additional weakness, a short-to-intermediate term bottom is near. So be ready to commit new funds to the long side if that should happen for a quick ride up to challenge the all-time highs. THE BOTTOM LINE: The internal breadth and sentiment indicators suggest that the market is becoming both oversold and under-loved. This could create the conditions for a short-term bottom that will set the stage for a new rally to challenge the all-time highs. If we get weakness on Monday and/or Tuesday, this might be a good time to re-enter the market on the long side.